I’m not the type to wear crystals in my bra, but in my pocket or purse is an entirely different story. 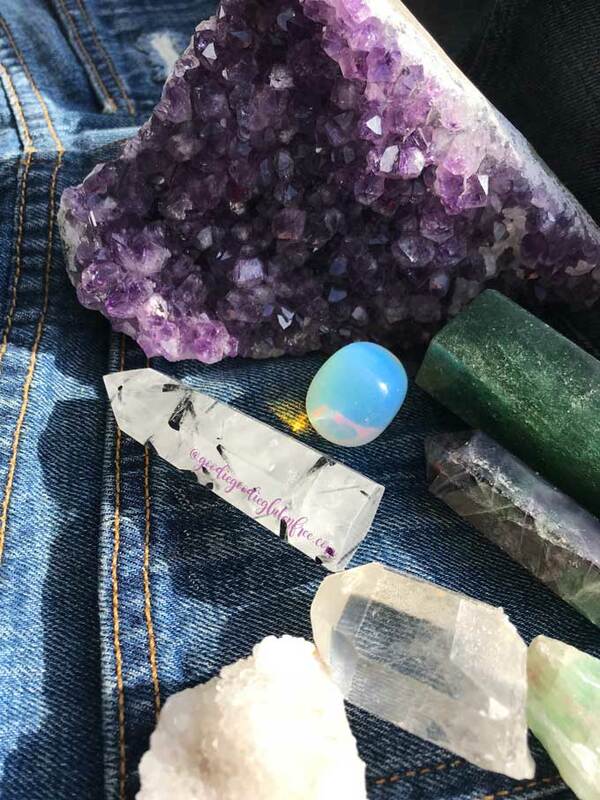 In any pair of jeans and random designer purses, you’ll find clear quartz for expansion, amethyst for healing and either a black tourmaline warding off negative energy/toxins or a red carnelian for grounding. My purses can get heavy every now and again when I forget that have crystals already in them and then add some more because I just didn’t realize. But it’s so worth the extra weight, because, for me, crystals are extremely healing. I add crystals like Rose Quartz, Selenite and Amethyst in the bathroom when I take Epsom salt baths merely for bringing in love (Rose Quartz) and to open up my ability to channel energy spiritually (Selenite and Amethyst) and to ultimately bring in a wave of healing energy from Amethyst into my healing bath. 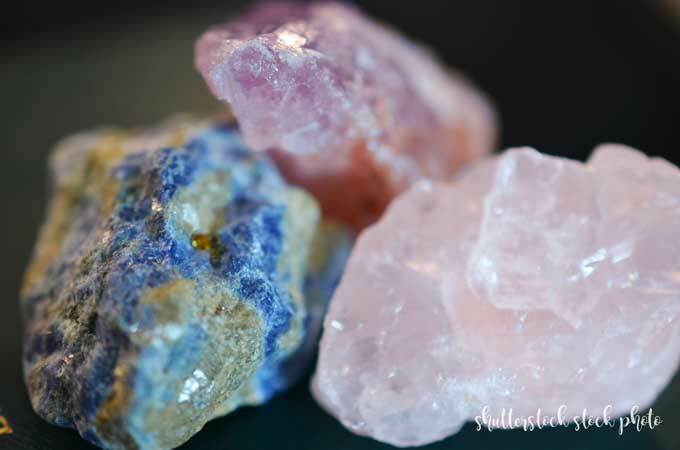 I have a beautiful Citrine cluster, Blue Lapis, and Rose Quartz by my bedside and I swear it makes me sleep so much better! (My prayer: Thank you Citrine for grounding me and thank you Rose Quartz for bringing in so much healing love). I have quite a few dark grounding stones by my desk to help me concentrate and ground me. The darker they are the more grounding properties they have, and the more they ward off negative energies and toxins. And lovely dreamy clear Quartz, and Opal on my dresser that I use in Angel Card Readings. Clear Quartz for spiritual evolution and Opal for is mystical properties. But anything you put belief into will work. Just as if you were into tarot cards, god, religion, numerology, sound healing, reiki, angel cards or anything else along this nature – it’s the belief that carries you and your faith. If you put your faith into it and wholeheartedly believe that this tool can heal, then it will be able to. That’s just the way it works. 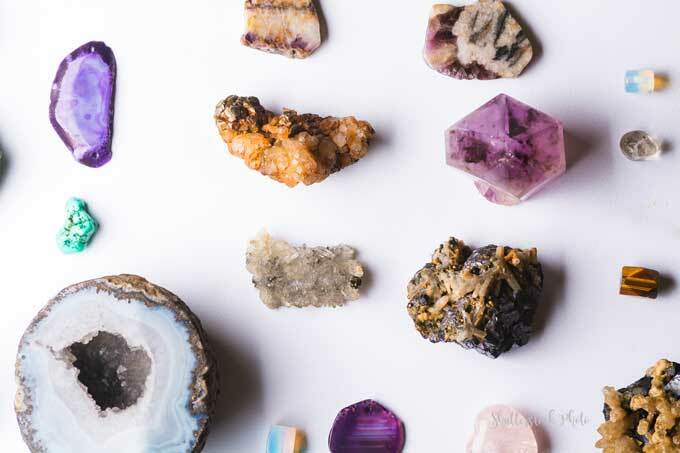 Between believing in yourself and believing in the power of ancient crystals that have lived on this earth for Eons, the energetic connection between you and the stone becomes magical. In my opinion, choosing crystals is even easier. While some may argue that you must have a particular stone in mind, I choose mine differently. I let my intuition lead me. 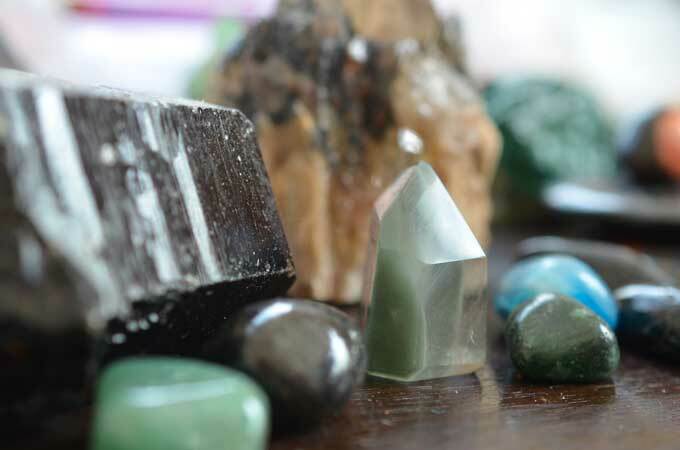 I understand and value that If I come into a crystal store and the one I wanted doesn’t pull me the way another stone does, I always get the stone my intuition guides me to. My intuition usually guides me to pieces that aren’t perfect and my favorite types of crystals are clusters and points. That my friend is energy. And crystals hold a LOT of energy. The way to do it is to go to the store and let your intuition lead. Look at everything, touch if you can. Really absorb the energy. Pick up a crystal book or two and read all about those descriptions and properties. And then make your choice or choices. You cannot go wrong, whatever you choose was meant for you. You can also go into a store knowing what stone you want and two things can happen. Either you get there and realize you no longer want that stone and opt for the stone that is pulling you or you go in and have a purpose to find that particular stone you had set out to find. Either way is not wrong. You will always meet the crystal or crystals that were meant to be in your protection. There are also many stones that have different properties. 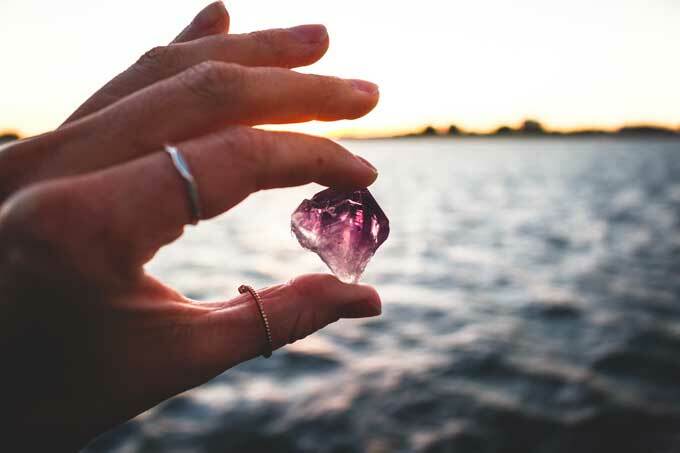 What I love about crystal healing is that these “rocks” have been around for centuries holding in zillions of vibes, next level energy and the stone that ends up in your hand is because there is a piece of the Universe that you are meant to have/hold. One of the first crystal stores I went to when I got “serious” about crystals and angel cards. I was led there. It was my beginning, but also my home. Prices are expensive because it’s a huge tourist spot for having you guessed? Crystals! But still a steal for New York City prices. I love the smell in there and you can feel free and explore the store in complete comfort. When you walk into this place it will feel like your in a pirates cave of crystals. They are everywhere! And it’s like a treasure hunt finding all the pieces you’re going to fall hard for. The further back you go, the more you’ll find. It’s actually where I found my favorite piece of Citrine that is part crystal points/part cluster/part rock. It’s by my bedside to help me sleep, and I swear it works well! Most of their pieces are from Brazil, but mostly all over the world. The owners are collectors so KNOW that this place is on the pricey side. It’s still so worth going because the store is just stunning. Small/medium pieces: 40$-$68. Be prepared to spend at this store. 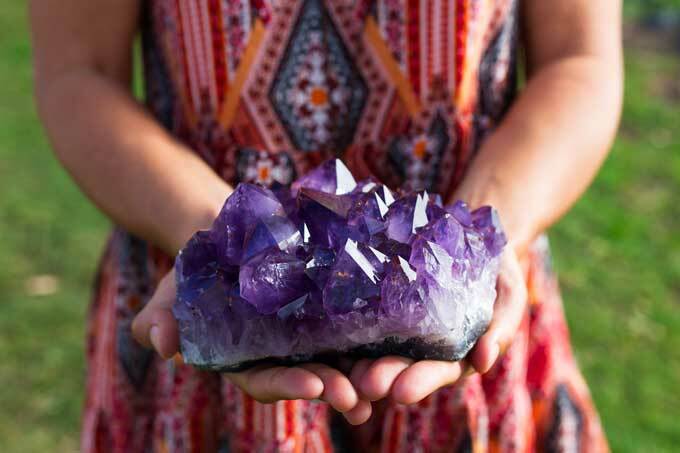 For a crystal experience, you need to go here! Actually, run! And bring your wallet, it’s like walking into a museum of crystals. Many are behind closed glass doors, and many you can just touch. The store is huge ranging from tiny pieces for jewelry to the largest crystals you’ve ever seen that are so stunning you’re going to want to take pictures of every piece! They even let you do Instagram stories in there! It’s a MUST GO experience. There is so much to look at it will remind you of an old class trip to the Museum! Pieces and collections are beyond unique in shape, size, the personality of the stone and where the stone comes from. Prepare to spend time at this store! The gal behind this site is so dedicated to her craft, her energy is amazing so I feel totally comfortable buying from her online vibe. I found the lady behind this gem in the Soul on Fire Podcast Group on Facebook that Jordan Younger runs. I love supporting fellow entrepreneurs so I naturally went to her site and ordered three crystals that I LOVE. They are huge and chunky and that’s exactly my style. They are exactly as pictured. This is an online store I completely trust. Katie does not disappoint. I bought a stunning Rose Quartz large/wide point, a beautiful Blue Lapis, and blank. bullet point this and add descriptions for those three crystals. Another amazing shop I found on Instagram that I LOVE is Crystal Phase Shop. This is an Etsy store and for that alone, I love this shop as I am an Etsy lover. It was so easy for me to check her out since I had an old Etsy account. And I was so happy because her selections are amazing, there is so much to look at. Her prices are AMAZING. And everything comes the way it looked in the picture, if not more beautiful. Great pieces, great prices. Probably the best priced one and total gem out of this entire list. 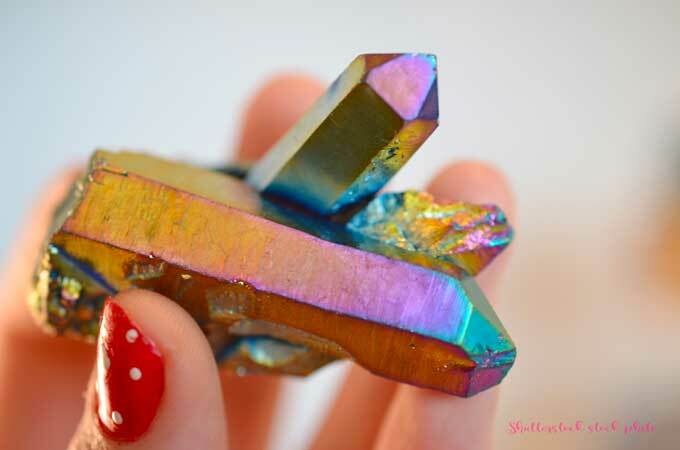 While I adore going to crystal shops to hold and feel the pieces, I know I get quality from this Etsy shop! Okay! So which crystals do you think you need?